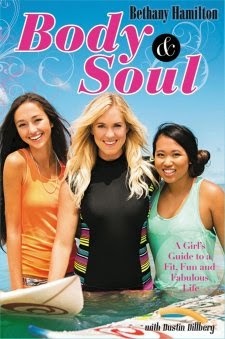 "Body and Soul: A Girl's Guide to a Fit, Fun and Fabulous Life" by Bethany Hamilton with Dustin Dillberg is a great resource for pre-teens, teens and even adults! Bethany has become famous for her amazing surf skills and for overcoming adversity through her faith in Jesus Christ. At the age of 13, Bethany was attacked by a 14 foot tiger shark while surfing with friends. Bethany lost her left arm, but not her determination or her faith. One month after the attack, Bethany returned to the water and to surfing -- ultimately achieving her dream of becoming a professional surfer. Bethany's inspirational story made headlines and was turned into the 2011 movie Soul Surfer. But -- back to the book! "Body and Soul" encourages young girls to develop a healthy lifestyle by focusing on body, mind and soul. While other health books might focus only on food and fitness, this book focuses on improving overall health, keeping a positive mindset and trusting in God's love and support. I really appreciate that Bible verses are interspersed throughout the book to continually emphasize the importance of faith in Jesus and of being spiritually healthy! "Body and Soul" has amazing photographs throughout which give step by step instructions for workouts and yummy looking results for recipes. Having these pictures makes it so much more inspiring! The exercises in "Body and Soul" are great for pre-teen and teen girls (though anyone can do them). There is an emphasis on strengthening your core, balance and posture. One section of the book has a 'q and a' section and a fun quiz that you can take to find out your exercise style. The recipes in "Body and Soul" have a Hawaiian influence and will encourage you to try new things on your plate. I like how there is even a section about what to skip -- things like artificial sweeteners and trans fats -- with examples of the specific names and an explanation of why they're bad for you. While the book has a focus on exercising and eating healthy, there is no condemnation here. Bethany suggests an occasional treat and says: "Even if you can't squeeze in a workout, starting your day with a prayer and some soulful deep breathing is almost just as good." Overall, "Body and Soul" is a great inspiration for any "gal" who is hoping to become healthier and looking for motivation. The book's focus is on being healthy -- inside and out and accepting yourself as God made you. What could be better than that for young girls in this day and age? Check out: Bethany's website for more information and inspiration! and most of all, how God has created the uniqueness of Y-O-U."